Students scatter from the South Campus when police released canisters of tear gas during an anti-Vietnam War demonstration. It was 1970 and Bruce Jackson was eating his typical dinner near South Campus. But Jackson, a new faculty member at the time, noticed trouble. He walked toward Norton Union — now Squire Hall — sensing commotion. His eyes began to water. And he never forgot what he saw next. Buffalo police officers were firing tear gas into UB’s old student union and women’s dormitories. It was a different time, and a different university. In the days when UB was just one campus, students and faculty made national headlines with uproarious political demonstrations. In the early 1970s, students participated in violent Vietnam War protests. The same year when four students at Kent State University were shot and killed, UB students put their safety on the line as they made their voices heard on campus. Today, former students and UB community members say they don’t see as many student activists on campus, but they encourage students to engage in university affairs. “I don’t read about much going on and hear about much going on,” Jackson said. Jackson, a SUNY Distinguished Professor, came to the university in 1967 and joined the English department. Between March and April 1970,The Spectrumreported police officers fired BB-sized birdshot bullets at demonstrators on South Campus. Officers also released tear-gas grenade launchers in several buildings around South Campus. Demonstrators reportedly damaged university property, including windows at Hayes Hall and Baird Hall (known today as Allen Hall). Students also torched the university’s Reserve Officer Training Corps building, according to Spectrumarchives. Students protestested the ROTC’s presence on campus in the midst of the Vietnam War. Students said they felt like the ROTC was training college students to be “war criminals,” according to Michael Frisch, a former UB faculty member. 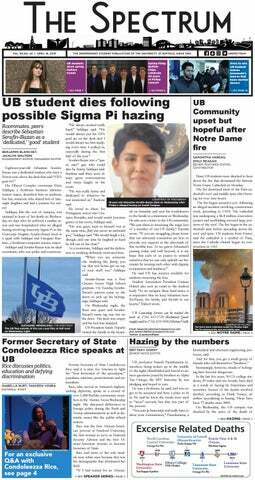 Students also questioned the roles of UB administrators, as faculty members called for then-acting UB President William Regan to resign from his role. Camille Hopkins, an undergraduate student from 1969 to 1972, said the Vietnam War was the main cause for the increased political engagement at the time. Hopkins said she and other students boycotted classes to protest the heavy police presence on campus. Hopkins left UB before finishing her degree in 1972. She returned to finish her undergraduate degree in 1977, but said UB’s atmosphere had changed significantly. Hopkins said she encountered cheating in her classes when she returned, which she attributes to the university’s change from a community-oriented campus to an individualistic student body. “The Vietnam War was over and people seemed to be uninterested in any kind of politics. Politics and activism disappeared,” Hopkins said. Jackson said he has only seen that trend continue. Jackson said the Vietnam War draft compelled many students and faculty to engage and organize themselves at UB. Frisch, a former UB history and American Studies professor, said students and faculty, including those less inclined to activism, united behind a common cause. Frisch said he never expected to be involved in political demonstrations at the time. “In most cases, people are just going about their lives so it takes a special set of circumstances [to demonstrate], and that’s what produces a sort of radicalization that can spread throughout [a community],” Frisch said. Scott Hollander, UB Libraries’ associate librarian for technology, communication and outreach, is an active promoter of University Archives and UB’s 172-year history. He said there is still an interest in politics today, although there was more on-campus political activity in the past. Next semester, Hollander said, University Archives plans to open an exhibit on the third floor of the Silverman Library in Capen Hall. The exhibit will focus on UB’s affiliation with civil rights movements from 1960 through 1975. Hollander said the exhibit is an opportunity for students to learn about the political history of the university. Clayton Markham, a freshman environmental engineering major, has been working on a research project for the exhibit. After researching Spectrumarchives and other first-hand accounts, he said students have something to learn from the students of years past. “I’ve noticed that students definitely felt more of a responsibility at that time,” Markham said. He said he’s seen recent on-campus movements, like UB Votes, which urge community members to vote through flyers and emails. Still, he said, he thinks students can do more. Editor's note: Previous versions of this article incorrectly stated that Bruce Jackson joined the American studies department when he came to UB and incorrectly referred to the former Norton Union as now-Harriman Hall. Isabella Nurt is a staff writer and can be reached at features@ubspectrum.com.